1130 – Battle announcer tells us that we have just launched an air strike of 300 planes against a Jap task force of 1 BB, 2 Cruisers and 10 DD’s, 220 miles away, North of Okinawa. Over 150 planes were shot down by Task Group 58.1 and 58.3 yesterday and an undetermined number over Okinawa. Supposed to be using all types of planes and this no doubt is their bid to stop us. DD reports 9 planes passed over it on its way to attack 58.1. Our CAP splashed 2 this morning. Jap got two hits, and neither serious yesterday. RANDOLPH joined us last night. 1222 – General Alarm ring as HANCOCK in task group on horizon received a bomb hit and is afire. 1234 – 5 planes shot down by CAP near our picket boat. 1315 – Our communications plane with air strikes over Jap surface force reports hit on BB, Cruiser and 3 DD’s dead in the water. 1326 – Secured from GQ. 1341 – General Alarm rings as task group 58.1 off of our port bow opens up on two planes coming in low. 1400 – 5 planes have been splashed by C.A.P. with another raid at 13 miles. 1420 – 58.3 opens up with intense AA fire and 1 plane is shot down in flames. 1500 – Since 1300, 9 single engine, and 5 twin engine planes have been shot down by our forces. 1615 – Captain tells crew incomplete reports have heavy cruiser sunk, other dead in water burning fiercely, 3 DD’s sunk, and BB hit by 3-1,000 lb bombs and torpedoes, making 1 knot in the water. All ships were hit in the Jap Task Force. 1645 – Captain announced that Jap BB, 2 cruisers and 5 DD’s were sunk. 2 DD’s left burning and dead in water from later reports. 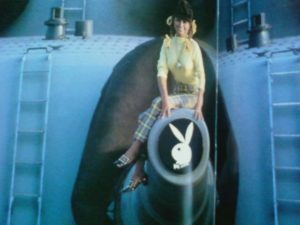 Another Jap BB and 3 DD’s reported under observation. April 11, 1945 – 1350 hours GQ. Many bogeys reported closing at 65 miles. 1406 – South Dakota and DD’s open up. 1411 – NJ opens up for 3 minutes and shoots down 4th plane – barely misses carrier exploding in water. 1440 – BUNKER HILL CAP reports shooting down 3 Japs. 1454 – NJ opens up, Plane just misses carrier in flames. 1506 – 6 planes have been shot down by ship’s AA fire and NJ continuously firing on targets. 1550 – USS KIDD coming alongside to transfer wounded personnel. According to Chief Feltes – In the 5 days from April 7, 1945 with the destruction of the Japanese fleet, including IJN YAMATO, and up through the announcement of President Roosevelt’s death occurring on April 12, 1945, USS NEW JERSEY was in nearly continuous combat. 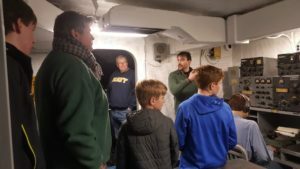 On April 14, USS NEW JERSEY began transfer of planes and spare parts. Again, according to Chief Feltes:“Looks like this is it!” as the ship leaves the task group with ENTERPRISE, MINNEAPOLIS, and 3 DD’s for Ulithi. “The first leg of our homeward journey.” On April 15, 1945, Admiral Badger transfers his flag to USS IOWA. On April 19, 1945, USS NEW JERSEY is underway for Pearl Harbor and the United States in company with USS MINNEAPOLIS. 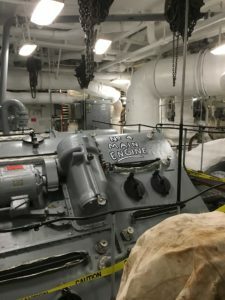 She arrived at Puget Sound Navy Yard on May 4, 1945, commenced unloading ammunition, and the crew began leave. 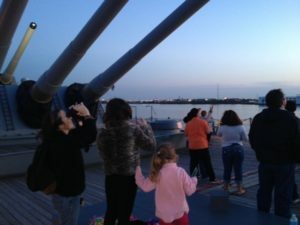 May 8, 1945 welcomes in VE Day, “Today the war in Europe came to an end!” On July 4, 1945, USS NEW JERSEY was underway again for Long Beach, and “10 day refresher course and gunnery exercise, before leaving for the combat area.” On August 2, 1945, USS NEW JERSEY put out for the forward area, and ”Eniwetok for a couple of weeks and to pick up Admiral Halsey. He will transfer his flag from USS MISSOURI. On the way, we will throw some shells at Wake Island.” On August 8, 1945 at 1000, we started to bombard Wake Island with 16” (106 rounds are recorded as fired at Wake…) opening up at 16,000 yards. Return fire was encountered from the beach when we closed to work them over with 5”… Aug 10, 1945 another atomic bomb dropped on Japan! August 13,1945 anchored in Apra Harbor, Guam at 1235… August 15, 1945 It’s official, the war is over! I was watching a show on the history channel last night about Iwo Jima. In explaining the battle, the narrator mentioned something about battleship support off the coast of the island and I wondered if my father had been there. 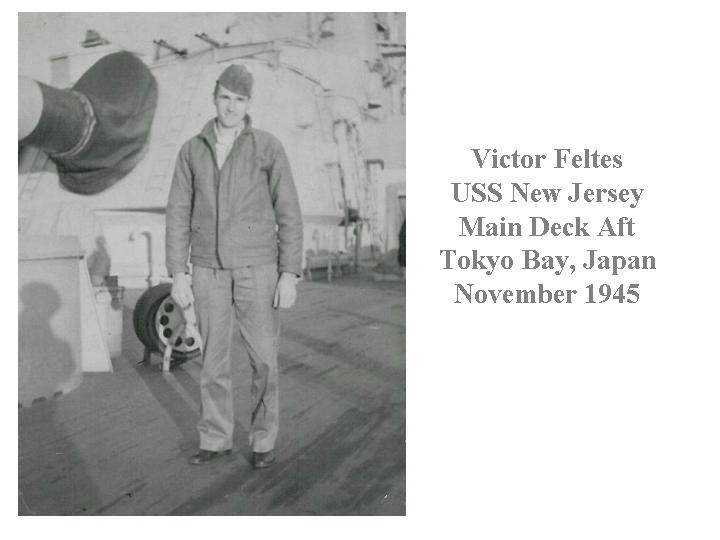 You see, as a young man my father served in the south pacific during WWII on the Battleship New Jersey. Curiosity aroused, I jumped onto the internet and did a Google search. I quickly punched in my father’s name and low and behold… I found your Jerseymanarticle! It is the article about the first edition of the ship’s newspaper where the paper held a contest to pick a name. An unbelievable amount of joy and pride swept over me as I read my father’s name. He was PFC. 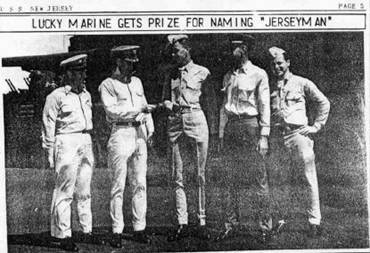 Carl W. Ritner, USMC… the young marine who submitted the winning entry of naming “The Jerseyman” in November of 1943. I can’t tell you how much I appreciate the gift you have given me. I quickly shared this information with my mother who was delighted to read it as well. Although she knew he was involved with the paper (she told me he drew some of the paper’s comics) she was unaware that he came up with the name for the paper. She will be happily passing this information on to my brother (Carl W. Ritner II) and sister. Although my father passed away in January of 1982, he is still in our hearts and we are very proud of his service on the Battleship New Jersey.